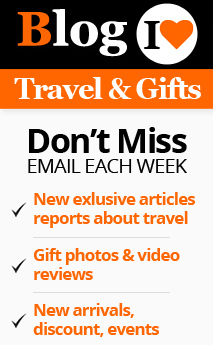 Oktoberfest is a festival that celebrates the most popu lar liquor in the world – the beer. This festival has undoubtedly originated in Germany, where beer and everything about it are celebrated. Drinking copious amount of beer is the way how the Germans celebrate anything and everything. So it does not come as a surprise that they made the wedding of one of their Princes, Prince Ludwig of Bavaria an occasion for revelry. The Oktoberfest started in 1810 when the Bavarian Prince, Prince Ludwig conducted a huge celebration in connection with his marriage to Princess Therese. The beer literally flowed through the streets of Bavaria. The highlight of the event was a horse race. People enjoyed the occasion so thoroughly that they made this a yearly event and the world’s biggest beer festival stared here. It was only natural that the German immigrants all over the world began to celebrate this and so Oktoberfest now is a worldwide event now. The German immigrants of America started to celebrate Halloween from the first half of the 20th century. Almost all the states in USA celebrate this beer festival with a verve that is no less than that of their German counterparts. The enthusiasm caught on with the establishment of microbreweries in America. Thereafter authentic German breweries entered the scene to make the festival more authentic. Even if the festival is named Oktoberfest, the actual commencing of the festivities occurs from mid-September onwards. The main feature of the festival remains the excess consumption of beer and sumptuous feasting. But the festivities do not stop at these. Many other tournaments and entertainment programs are conducted in connection with the O ktoberfest. The actual items of entertainment differ from place to place. 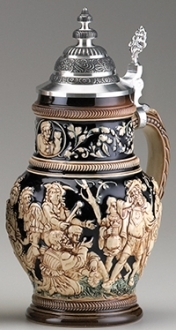 While consumption of beer stays the best part of the Oktoberfest, drinking from a visually pleasing stein doubles the enjoyment. 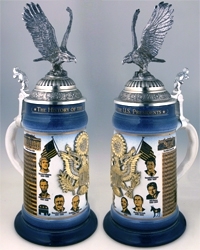 The German Americans give the festival a decidedly fabulous American feature, by using beer steins with American themes. These include themes with patriotic, nature, historical and political relevance. 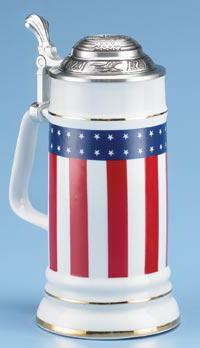 By drinking from a beer stein with an American patriotic theme the immigrants show their commitment towards the country that has adopted them. By doing so, they actually identify themselves with the great American dream. 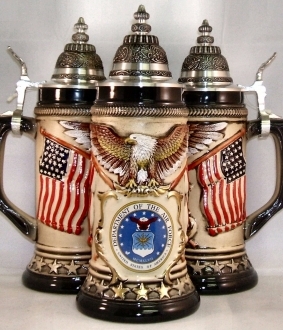 Oktoberfest beer steins with American themes can be used as gifts for family and friends. 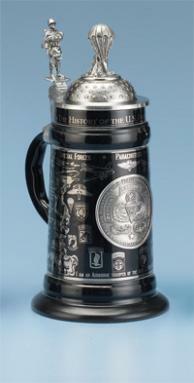 Almost all features of America – like the American flag, the eagle, the statue of liberty, scenes from American history and American militia symbols are replicated very imaginatively on the reliefs of these steins. You can select the theme you like.